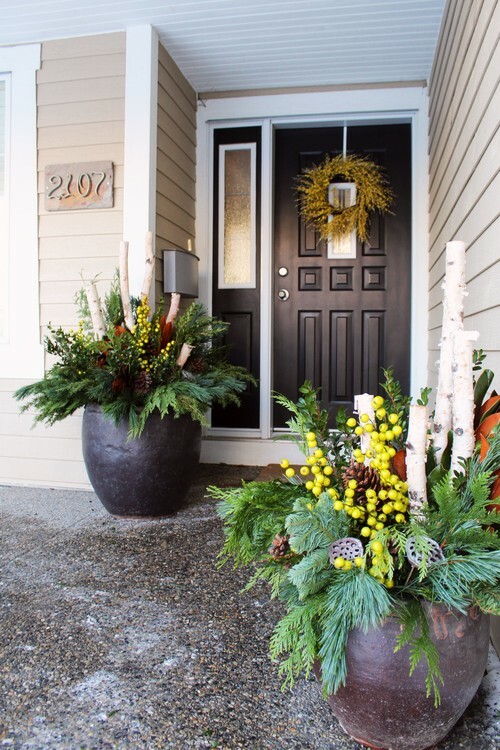 I always try to do something fun and extra festive for the planters on my porch for the holidays. And hopefully make something that will last LONG past Christmas, so it will be able to stay on the porch throughout the rest of winter. Around here there’s not a lot of prettiness happening in mid-January, so it’s sort of nice to pull in the driveway and not have a cold, empty, bleak looking porch staring me in the face. 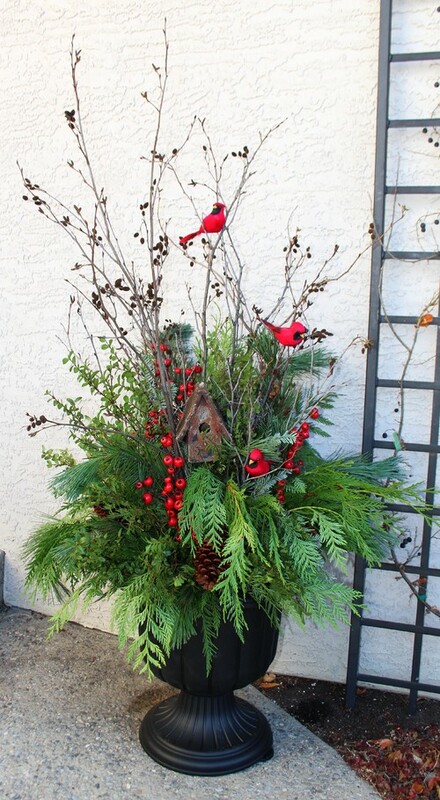 Last year I made my outdoor planters with traditional greens, birch branches and bright red winterberry. 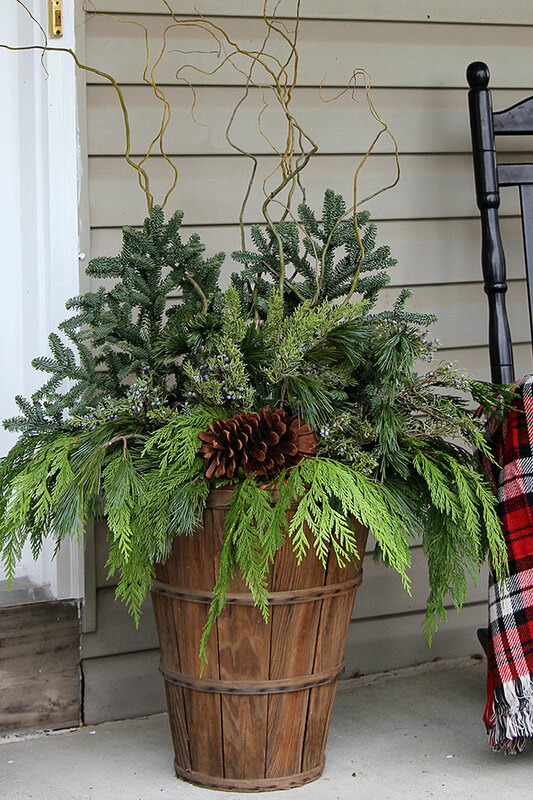 And the previous year I made my pots with a rustic design with curly willow, pinecones and greenery all “planted” in a peach basket. 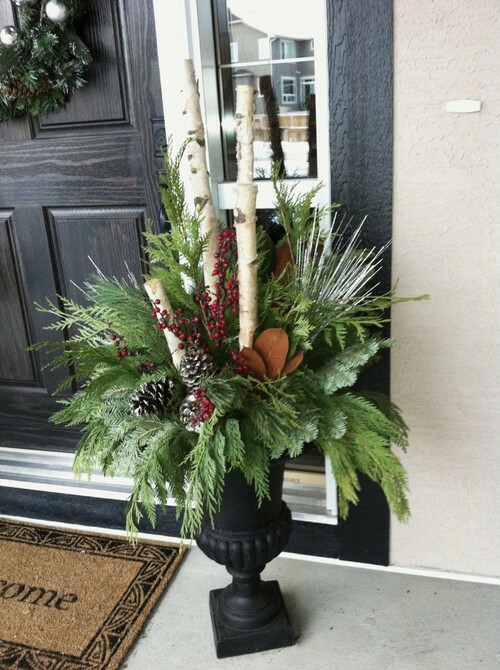 NOTE: These types of planters are RIDICULOUSLY EASY to make. 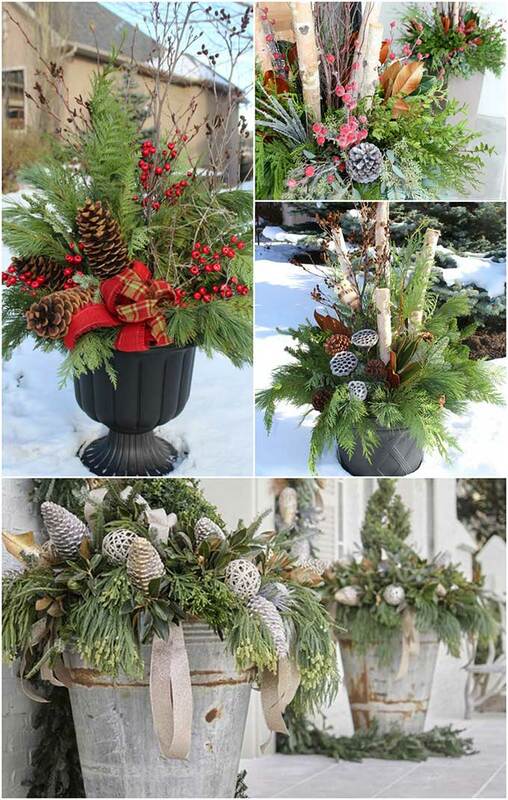 You can see a step by step tutorial including a video on my How To Make Winter Porch Pots post! This year, who knows what I’ll come up with eventually, but I have been looking for some new ideas. Here are some that I found that spoke to me. These MASSIVE planters sure do make a statement. 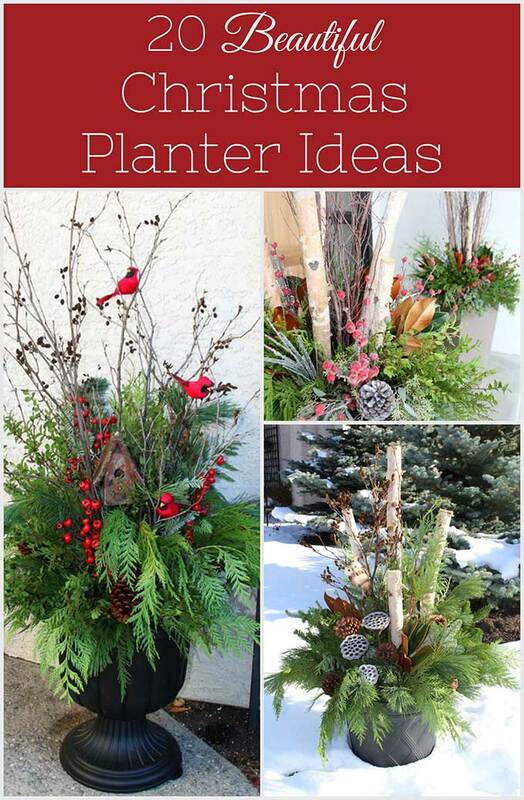 If I made those I would definitely fill in the bottom with plastic milk jugs or styrofoam to make them a little lighter, because large planters can get pretty heavy. 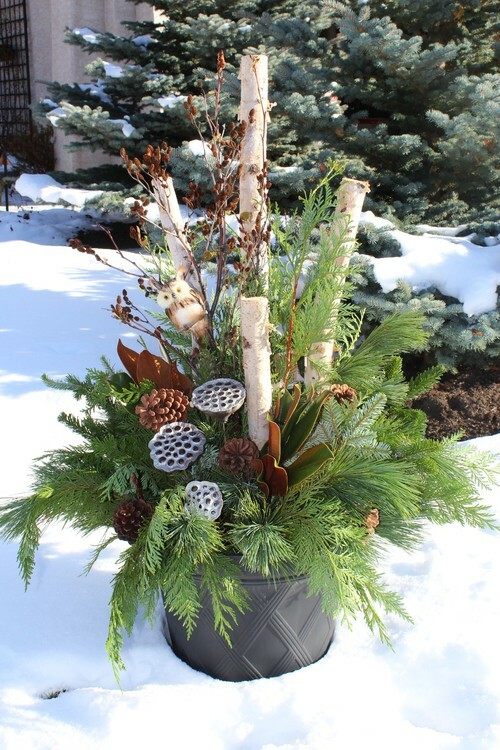 A similar look is this planter with the birch branches, seed pods and magnolia leaves. There’s even a cute little owl peaking out there. 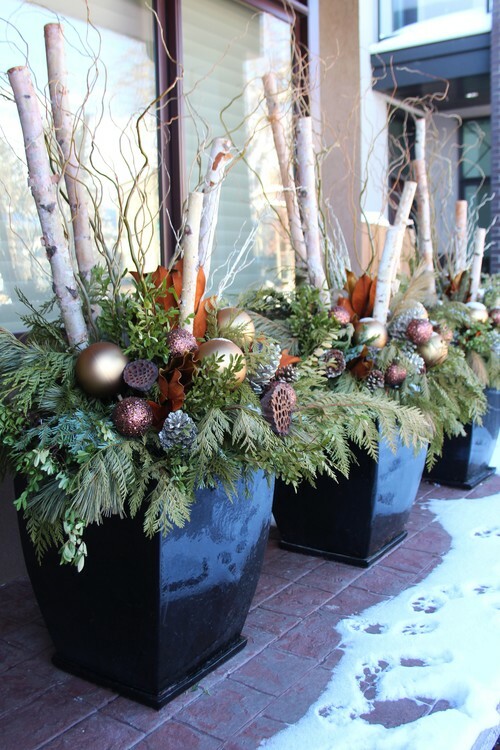 Not sure if it’s “real” frost or just made to look that way, but the muted frosty tones of these planters are gorgeous! 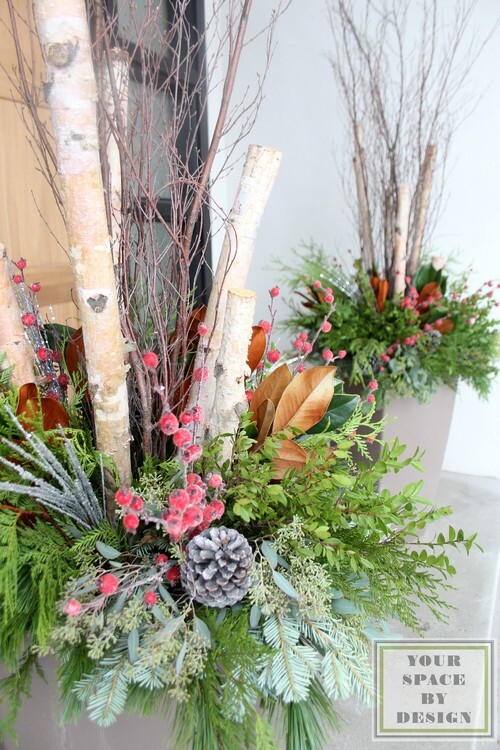 The pop of green berries and seed pods make for a more neutral natural decor look. These containers themselves are just amazing!!! 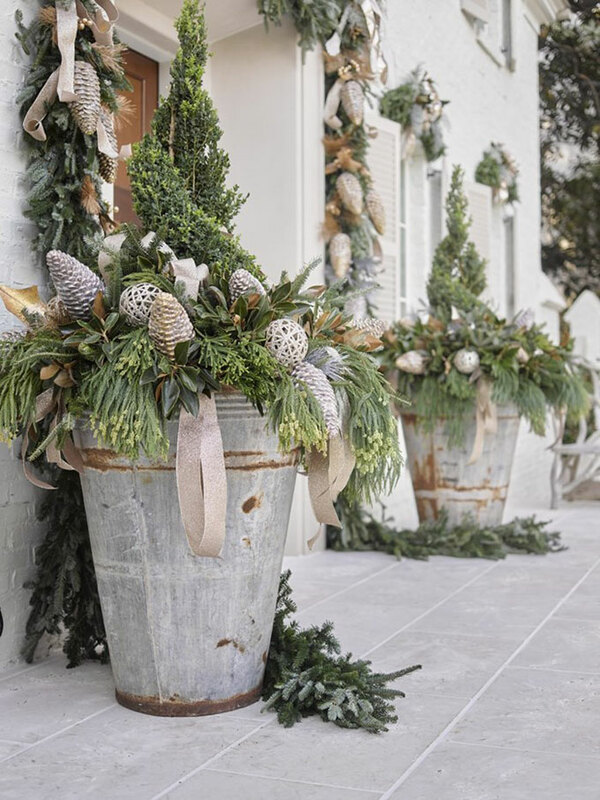 Throw in the topiaries and the silver and gold accent pieces and they certainly have a festive look. And who says you have to plant something in a pot? 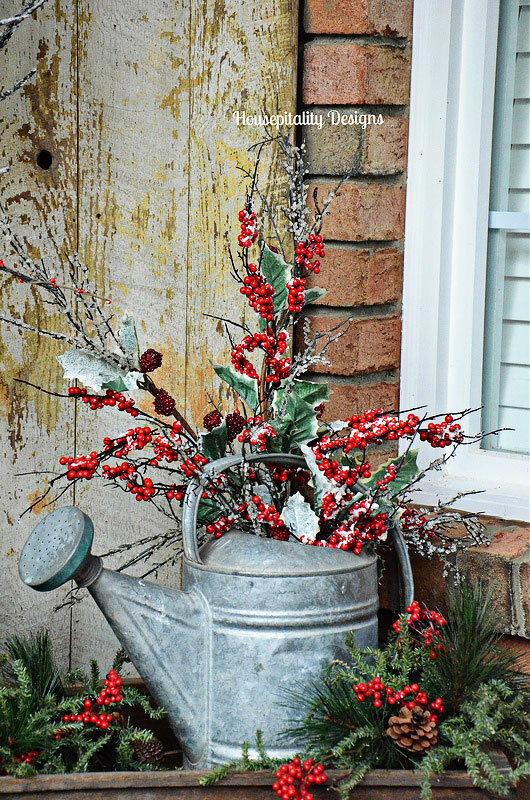 This watering can full of holly and winterberry is GORGEOUS! There’s a nice assortment of fruits and nuts in this planter to add some color. They even have some pinecones painted white! 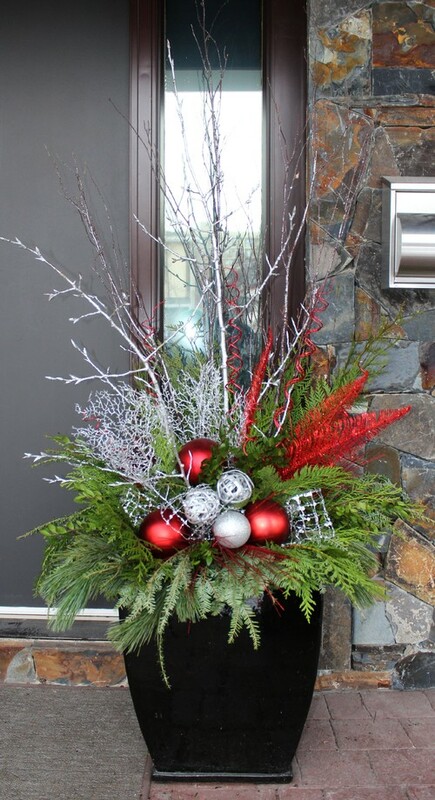 Similar in style to my black urns, this is a nice pop of color while still staying natural. 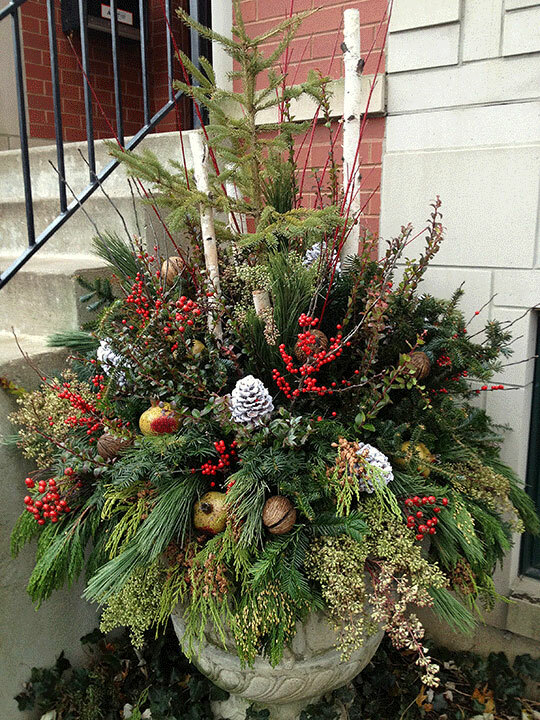 Although I normally stay “natural” with my urns and planters, I think this burst of colorful Christmas balls and painted twigs are a fun look! I had a big lighted reindeer named Rodney on my porch last year, so maybe I’ll extend the “whimsy” to my winter planters this year! The branches on this one make the perfect spot for the cardinals to sit. 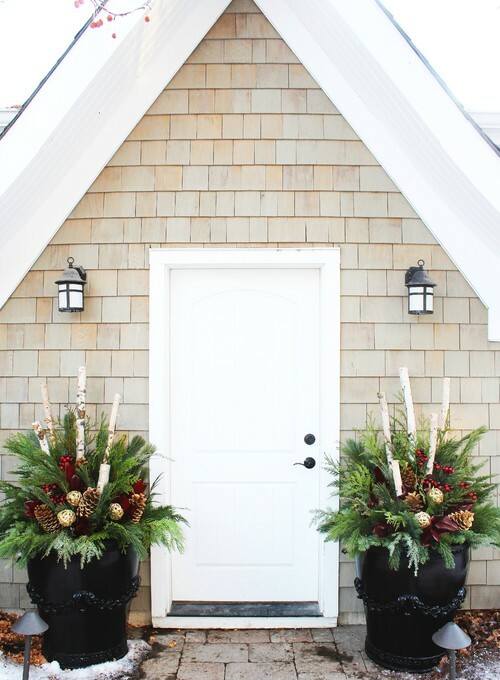 I love the formality of a urn on the porch. 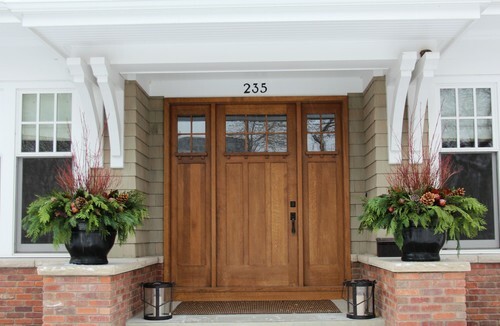 I don’t know if I like the door to the house better than the planters, but it shows that lower profile planters can work very well on a porch. I really do like that door though!!! And if two pots are good, then three are definitely a statement. 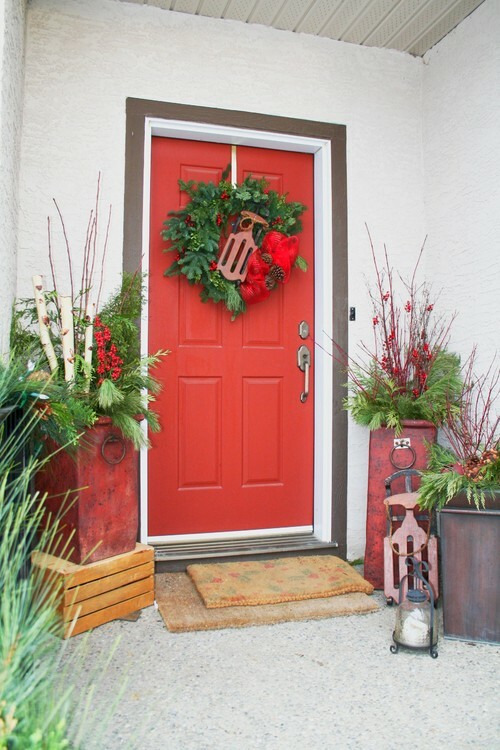 And don’t think you need to stick with natural colors or traditional red and green, blue can be a show stopper too! This one has a blue pot AND blue accents. This one sticks with a more traditional planter and just adds blue and white where it counts! You don’t have to do the same thing in each container either. 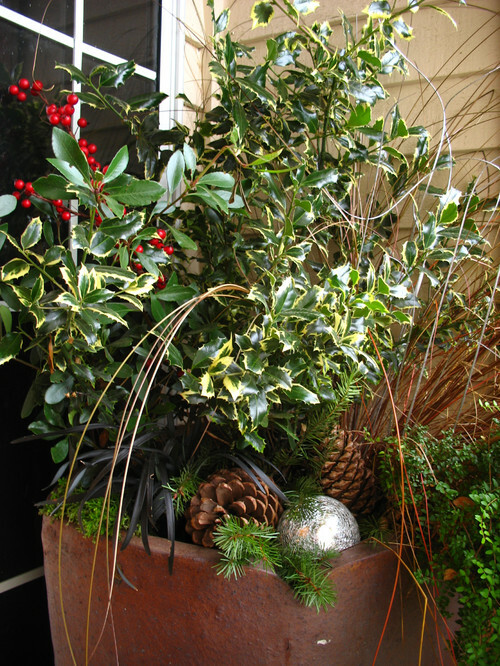 This is a good example of using different sized containers and planting slightly different plantings in each. 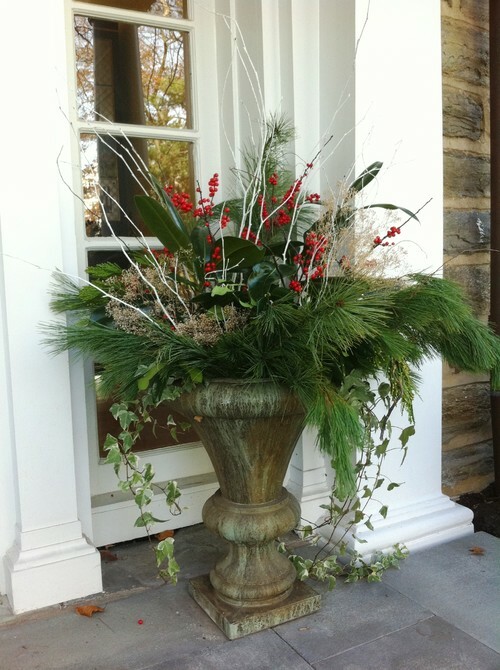 If you live in a warmer climate you can get away with some ivy in your planter also. 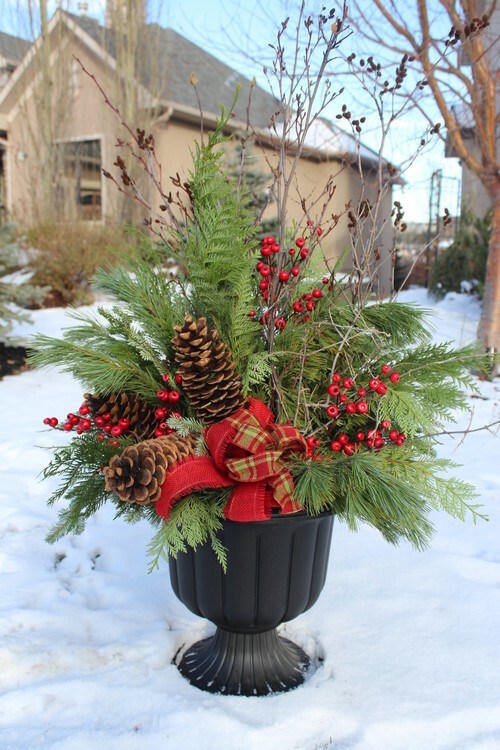 Or what about some holly instead of pine? In my book, holly isn’t used nearly as often as it should be. 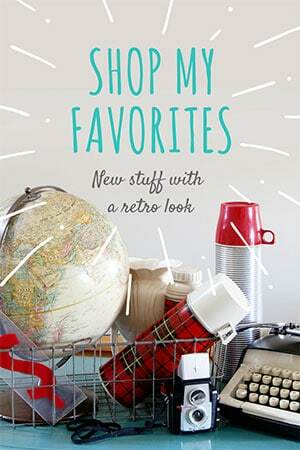 OK, now that you’ve had a look around, which is your favorite? When I make mine, I stick the branches in dirt! I’ll just clip off what was in the pot previously, stick the greens and branches in the dirt and then water it well. For instance if it was a pot of mums, I’ll clip the flowered part off down to the dirt and leave the roots still in the pot to make a thicker surface to stick the greens into. 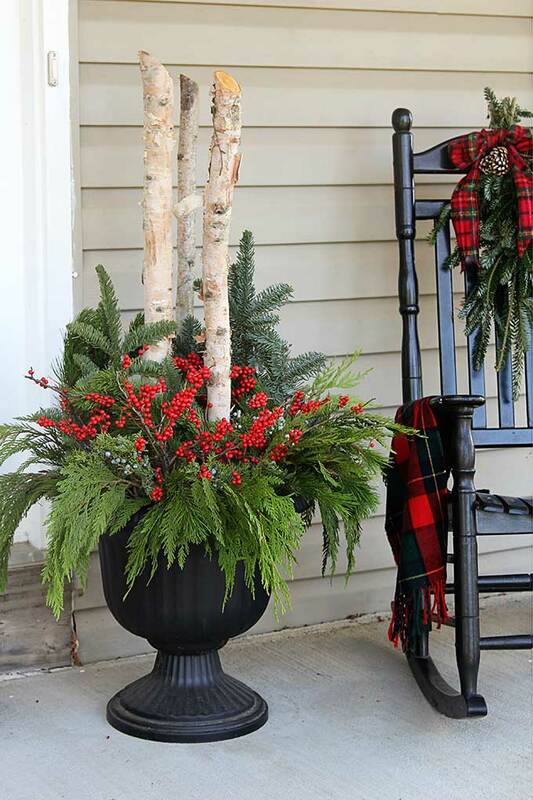 If you don’t have flowers in the pot already you can just fill the pot with potting soil, the other way just makes a firmer place to hold up your branches. You don’t need to keep watering after that initial watering, because the water sort of freezes the branches in place and will stay damp enough for a few months. Mine have stayed fresh all the way up until the end of February which is when I normally start to think about changing it up to something more spring-like. So glad you liked it! Hope you have a wonderful Thanksgiving! They are all stunning and beautiful, Pam! I love the combination of green, white and red. That combination wins inside our home. However, outside, we celebrate the season with police officer blues. Love the large darker blue planter. 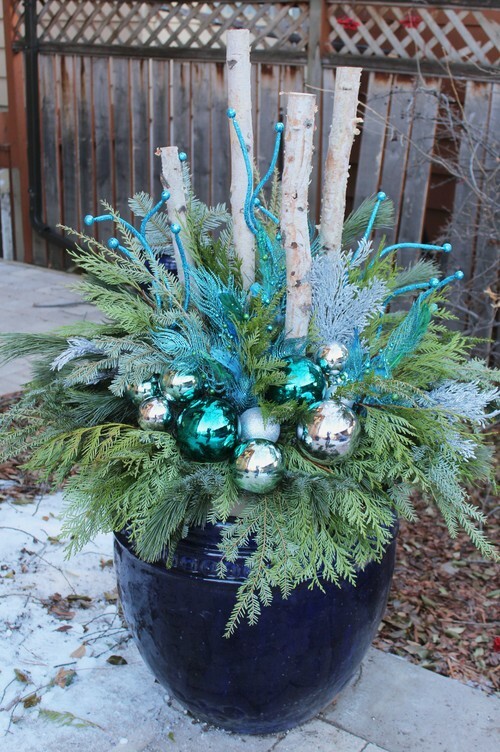 I would add several darker hues of blue to pick up the deeper color of the planter. 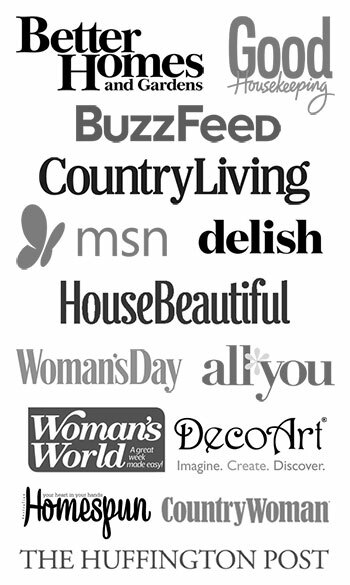 Gorgeous and inspirational ideas! Wish they were pinable. Wish the links went directly to the photos. These are all so pretty, Pam! I really need to do a nice pot at the lakehouse! Thanks for the inspiration! Yes, they’re great! I usually do my pots the day after Thanksgiving, but we’ve had such cold weather that the dirt is pretty frozen I’ll figure it out. What about bringing them into the house for a few weeks? Haven’t tried that but I might- protecting the floor, of course. I use a vintage aluminum tree but miss the frangrance of pine! What a gorgeous post! So many lovely plants and arrangements! LOVE and pinned! Thanks for sharing so many beautiful ideas. Hi Pam, thanks for sharing amazing blog. I love to do gardening in my spare time. Keep sharing.